When it is time to put up a birdhouse, whether you are putting up a new house for the first time or repositioning an old house, understanding how to best hang the house will make it more attractive to nesting birds. Properly mounted birdhouses are also easier to monitor and care for, ensuring plenty of birding excitement for many nesting seasons to come. Mounting Mechanism: How the house is mounted affects its safety and security. Many birdhouses are designed to be attached to a tree, building, or pole where they will be stable and comfortable to birds, but some designs may be hung with hooks, wires, ropes, or chains. Some birds don't mind a bit of swinging, though others will avoid less stable houses. To be safe, research the mounting mechanism your backyard birds prefer before putting up the house. Location: Ideally, the house should be in a private area somewhat remote from nearby feeders or bird baths where a lot of other activity could make brooding parents anxious. Placing a birdhouse in a more concealed area helps camouflage the house, and nearby branches for perching will give adult birds a good place to watch over their family. Some birds, such as bluebirds and purple martins, do prefer birdhouses in more open areas. Height: Different species have different preferences for the heights at which they will build their nests (see list below). Higher houses are generally safer from feral cats and similar predators, but they can be more difficult to mount, clean, and monitor. It is most important that the house is mounted safely and securely, even if the height may not be ideal. Climate: In excessively rainy areas, it is best to mount a birdhouse in a sheltered area, while in a very hot region, a cooler, shaded location is essential. The entrance hole should always be facing away from prevailing winds to help protect delicate hatchlings. Safety: Regardless of where the house is mounted, it should be sturdy and resistant to wobbling or slipping. Baffles placed above and below the house can help deter predators such as raccoons, rats, and snakes, and the birdhouse itself should be designed to be safe. Monitoring and Cleaning: No matter which birds will be using the house, birders must be able to access the house regularly for proper cleaning and to monitor any hatchlings. Mount the house where there is sturdy, level ground below if a stool or ladder will be required to reach it. Other Houses: Even social, gregarious birds need privacy to feel secure when raising a family. Usually, only 1 to 2 birdhouses may be in use in one yard at the same time, with the exception of homes for colonial species such as purple martins. Mounting several houses, however, will give birds a greater selection for choosing the location they prefer and will increase the chances of birds nesting in the yard, even if not every house is used at once. Several models of window-mount birdhouses with clear or one-way mirror back panels are available, with the enticing promise of allowing birders to watch birds raising their families with comfortable indoor viewing. While birds will use these houses, it is still important that they be sturdily mounted, preferably on a window of a quiet room so nesting parents are stressed as little as possible. If birds do use the house, observers should avoid tapping on the glass or otherwise disturbing the birds while the nest is being brooded or when the chicks are young. Using curtains inside the room can help keep disturbances to a minimum, and curtains are easy to move aside to check the house. If nesting birds are disturbed too much, the parents may abandon their nest, or the chicks could try to leave the nest prematurely. Use the best hardware and proper mounting equipment to ensure security and stability. Offer nesting material nearby to entice birds to use the birdhouse more readily. Put up the house early so it is available as soon as birds begin looking for real estate. Check the house after storms or severe weather and repair any damage if needed. 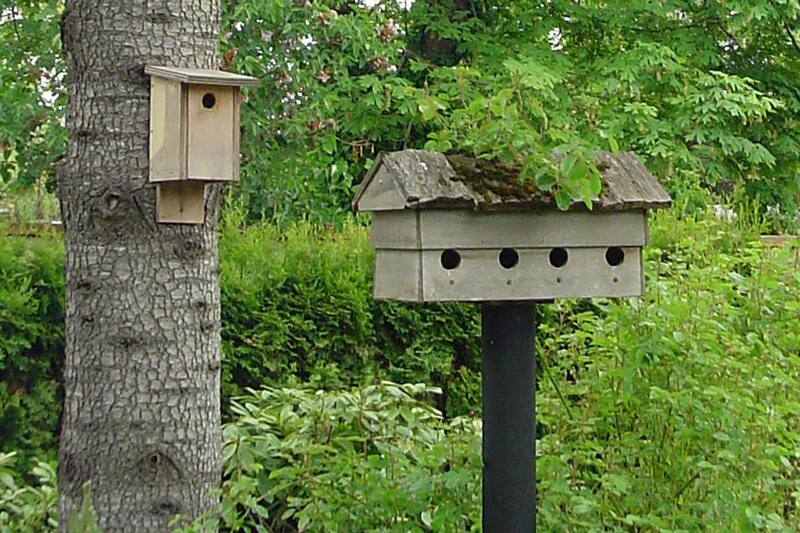 Leave the birdhouse up through fall and winter as a bird roost box for extra shelter. Birds may not seem picky about where they nest each year, but taking care to hang birdhouses in the best possible way will make them even more attractive to all the cavity-nesting birds that need a place to call home. The following heights (in feet and meters) are the ideal ranges for where to mount birdhouses for different species. While these heights may be the preferred mounting places for birdhouses, birders should be aware that birds are quite flexible with height requirements and may easily choose a home outside their ideal range. If houses are mounted safely at approximately the proper height, they will easily be attractive homes for birds that use houses.